Prior to the second trial, the couple entered into a stipulation that certain retirement account withdrawals made by the husband between June 2009 and April 2010 were to be treated as “post-separation” transactions. The trial court accepted the stipulation, but it later ruled that since the parties had not “separated” until April 2010 (when the husband moved out), the retirement withdrawals were to be considered pre-separation. The wife appealed, arguing that the trial court erred by ignoring a pretrial stipulation that the withdrawals from his retirement accounts were made post-separation. Under California law, the date of separation is significant when determining the nature of community versus separate property. Under the State Family Code, Section 771, any earnings and accumulations of a spouse — while living separate and apart from the other spouse — are treated as his or her separate property. The wife argued that the court’s decision to ignore the agreement resulted in a “surprise” and denied her due process of law. That is, if she had known that the date of separation was going to be an issue at trial, she would have tried to prove that the retirement funds were not used for community purposes. Instead, she relied on the assumption provided by the stipulation. The court of appeals in this case looked at the parties’ expectations concerning the effect of the stipulation. Under California law, courts have a duty to treat a stipulation as to material facts as having been established by the “clearest proof.” Since both parties agreed to the nature of the withdrawals, and the court did not reject the stipulation, the parties relied on the stipulation throughout the trial. The court of appeals concluded that the lower court could not thereafter disregard the agreement, and it ruled that the withdrawals from the husband’s retirement account occurred post-separation. The division of property in any divorce case is a complicated process that has the potential to affect the parties’ relative financial standing in a serious way going forward. For this reason alone, couples are encouraged to reach out to an experienced family law lawyer – someone who handles such cases on a daily basis. For more than 20 years, Roy M. Doppelt has been representing parties in divorce matters in San Diego and throughout Southern California. 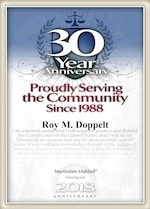 For a free consultation with a dedicated and experienced family law lawyer, contact Doppelt and Forney, APLC through the law firm’s website or give us a call toll-free at (800) ROY IS IT (769-4748).